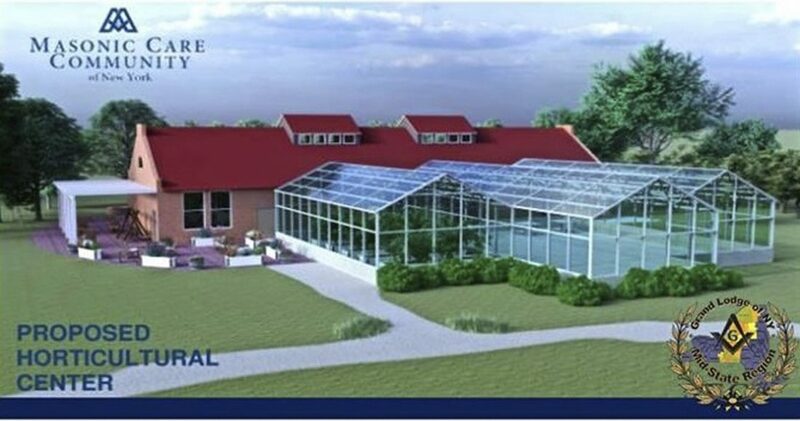 Pictured is a the proposed new Greenhouse and Horticultural Learning Center in Utica. On Tuesday, March 19, from 7 to 8 p.m., the Grand Lodge of Free and Accepted Masons of the State of New York will be holding a Telethon to support the Brotherhood Fund and the Masonic Care Community in Utica, N.Y. Donations made during the telethon and specified as for the MCC, or the Grand Master’s Allocation, will be used to support the construction of the new Greenhouse and Horticultural Learning Center at the MCC. In Addition, all donations to the MCC made during the telethon, will be matched dollar for dollar. Because of this event, the Brothers of Forest Lodge No. 166 F & AM will be dedicating the proceeds of their upcoming Pancake Breakfast to the telethon and Greenhouse fund. The upcoming Sunday Family Breakfast will be on March 17, from 8:30 a.m. to 12:30 p.m. This all-you-can-eat breakfast will consist of eggs made to order, pancakes or French toast, sausages, fruit cocktail, toast, juice, milk, coffee and tea. Adults and teenagers 13 and up: $8; Children 6 to 12: $4; kids 5 and under are free. The public is welcome and cordially invited to attend, as is anyone with interests in learning more about Freemasonry. Forest Lodge is located at 321 East Main St.(Route 20), Fredonia. There will also be a basket raffle at the breakfast, of which all proceeds will additionally be donated to the telethon. Donations will also be collected during the breakfast, and of course, phone-in donations during the Telethon will be greatly appreciated. For those who aren’t familiar, the Freemasons are the world’s oldest and largest fraternity. Their goal is to bring good men of all religions, ethnic backgrounds and all walks of life together, to promote harmony, civility, religious tolerance, democracy, and charity. They do this by utilizing ancient teaching methods of using symbols, and actual working tools, to help imprint the lessons upon the mind of the members. Members work to help promote the betterment of humankind, by teaching the members to be better fathers, husbands and men. The Grand Lodge of New York and its affiliates, operates the Masonic Medical Research Institute in Utica, which is an internationally recognized biomedical research institute for genetic screening and drug development for inherited cardiac arrhythmia diseases. They also operate the Masonic Care Community in Utica, a safe and active independent retirement community offering a full spectrum of services. Properties also include Camp Turk, a residential camp for kids between the ages of 8 to 16, in the beautiful Adirondack forest, The George Washington historic site in Tappan, New York, and the Chancellor Robert R. Livingston Masonic Library at the Grand Lodge building in New York City. Several youth programs are offered by the Masons to their members and families, as well as educational assistance opportunities, and various awards through both Grand Lodge, and local community Lodges as well. The fraternity is open to men, 18 and over and a New York resident for one year (to be a member here), with no felony convictions, and a belief in a Supreme Being (of any religion). Those wishing to join the fraternity should inquire with a local Lodge, or a member thereof, and will have to go through a background check as well as an interview, and an initiation process that has gone on for centuries. More information is available at www.discovermasonry.com.